Playing is a very valuable pastime for the healthy development of your baby’s cognitive, social, emotional and physical growth, and it’s a fun way for you and your baby to bond and form a loving relationship. Babies are constantly using their senses to learn new things from their surroundings and experiences, especially within their first year. Exploration and being subjected to a variety of stimulants are at the heart of play, so it’s important that you provide that for your baby. Although there are lots of games you and your baby can play at home, the following are a few examples of places you can take your baby to play outside of the house. The Science CentreScience centres are great places to take babies to play because there is always something interesting for baby to see, smell, hear and touch. They are centres where adults and babies can play, create and discover together. You can play in water, blow bubbles, colour, make music and more. Nowhere else can provide as much stimulation as science centres. Indoor PlaylandsMany indoor playlands cater for children ages 0-8, and some are starting to offer structured activities for specific age groups. Many playlands also have baby and toddler-specific play rooms with plenty of mats, padding and age-specific toys for the kids to play with, and are also useful for keeping babies separated from the more rambunctious older children. Taking your baby to the local pool to have a fun time splashing around is a great way to exercise your baby and get her or him accustomed to the water. Most pools will have a special wading area with warmer water and fun water toys that are more baby-friendly, and newer facilities also have a special changing area dedicated to babies and parents. This way you have somewhere to store the nappy bag and baby clothing. 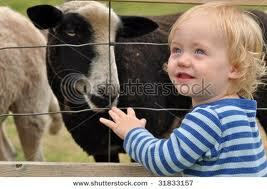 Zoos are great places to take a baby to begin exposing them to new things, and petting zoos are even better. This allows your baby to get up-close and personal with the animals and nature, which will really helps to satiate her or his inquisitive mind. Taking your baby to drop-in programs at a family resource centre is a great way for them to stretch their learning muscles, as well as socialise with other babies. These programs usually offer creative activities, painting, puzzles, blocks, and other baby-appropriate toys. Often there are also activities that many parents and their babies can do together which help babies to create strong social and emotional bonds with others. This is not only a great way for you to meet other parents, but also to have your baby use toys that are new and different from the ones at home. GymboreeGymboree play and music centres offer programs that are geared specifically towards the interests of babies aged 0-6 months. Classes generally focus of developing your baby’s interest in the world through sensory exploration. Stimulating age-appropriate activities such as tummy time, flashlight play and infant massage help babies build trust, a sense of security and emotional connections with others. These centres sometimes offer educational and fitness classes as well, and provides another great opportunity for you to bond with your baby. Apalagi saya masih mempunyai anak kecil berusia 3 tahun.